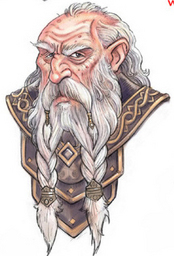 Davked in an ancient dwarf who has seen centuries of life in Cauldron. He is head of the noble house, Splintershield Hall, and has a seat on the Cauldron City Council. He has survived his late wife by fifty years now and has tried in vain to raise his two sons, Xerlon and Zenith. Both sons have spent the last few decades running amok in the Cauldron region, trying to outdo the other in heroic accomplishments. Xerlon currently runs a permanent operation at the base of a nearby volcano, campaigning against the Hookface brood, while Zenith has taken to reclaiming the original dwarven outpost in Cauldron, the Malachite Hold, far beneath the streets of the city itself. Davked is embittered when it comes to either one of his sons. While he understands Xerlon will take his place after he is gone as head of the Hall, Custodian of the Shrine of Moradin and member of the Cauldron City Council, none of this changes his heart about his eldest son and he sees Xerlon as an overly-stubborn, greedy opportunist who doesn’t understand his place in the world – namely to be at his father’s side rather than running off with his playmates to make war against dragons. Davked feels even less for his younger son, Zenith, and has never connected with the poor boy. Braenna was surprised to discover recently that Davked and House Splintershield is interested in becoming her patron in her chosen craft of smithing. Davked sees something in her that perhaps he does not see in his own sons. Only time will tell how this scenario will play out.